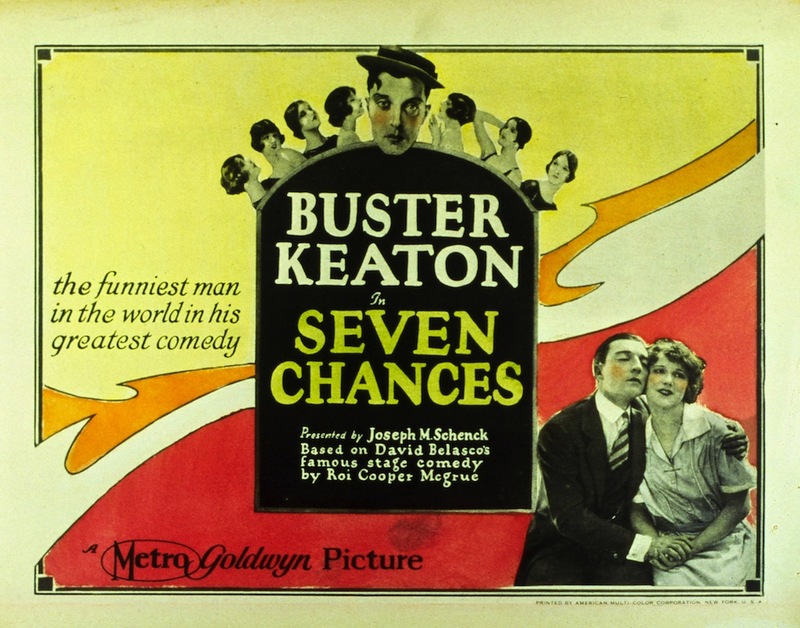 Original promotional art for 'Seven Chances' (1925). Next up: an old favorite, but in a new venue. 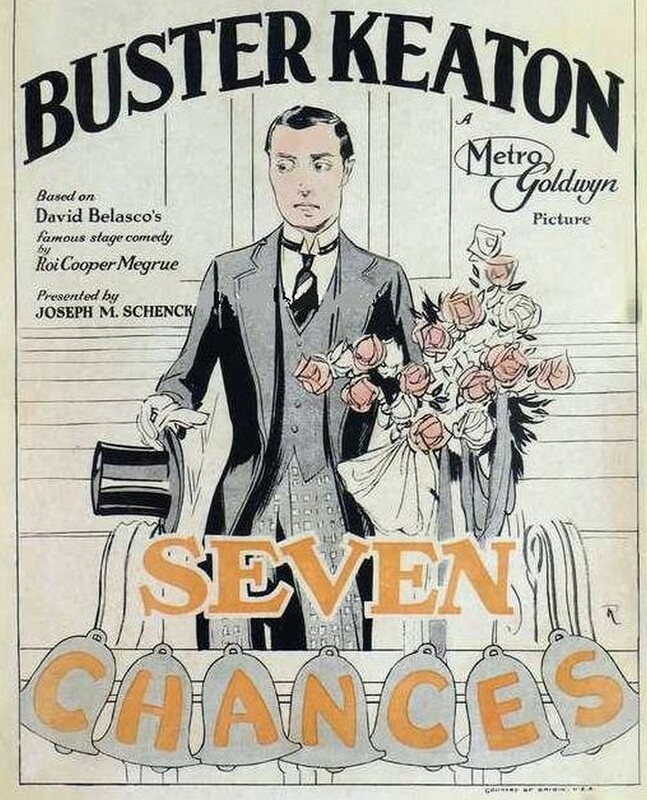 On Tuesday, Jan. 31, I'm doing music for Buster Keaton's 'Seven Chances' at Phillips Exeter Academy. Showtime is 7 p.m. The free program, part of a concert series run by the school's Music Department, takes place in Phillips Church on the campus, which is in downtown Exeter. 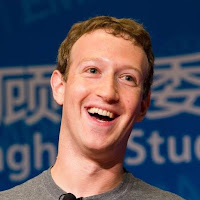 As a product of the New Hampshire public school system, it's quite a coup to perform at Phillips Exeter, whose alumni include Mark Zuckerberg (at left), Dan Brown, Gore Vidal, John Irving, and Franklin Pierce, the 14th President of the United States and the only one from New Hampshire. Prior to the upcoming concert, my only connection to Phillips Exeter was when a girlfriend in college enrolled in a summer program there. So one Friday I played hooky from my summer job at a machine shop and rode my bike all the way from Nashua to Exeter just to drop by for a visit. I was okay going out, and we had a nice time. But I didn't fare too well on the way home, as temperatures reached the mid-90s on a cloudless afternoon. I got as far as the Dairy Queen that used to be on Route 28 in Salem, where I made the mistake of thinking a coffee frappe would get me home. Instead, it made me ill! I got home before dark, but with a nice case of heatstroke and dehydration, which kept me in bed for the entire weekend. My inclusion in the Phillips Exeter concert series came about from a series of silent film screenings we staged last year at Exeter's venerable Old Town Hall. In the audience at one show was Peter Schultz, chairman of the Academy's music department. We got to talking afterwards, and the result was an invitation to do a screening at Phillips Exeter Academy. In a case like this, where it's potentially a new audience for the silent film experience, Keaton's 'Seven Chances' (1925) is one of the go-to films: I often refer to it (and to all of Keaton, really) as one of the "gateway drugs" of silent film. So if you're in the area, I hope you'll 'go to' the screening Tuesday night. More info in the press release below. EXETER, N.H.—He never smiled on camera, earning him the nickname of "the Great Stone Face." But Buster Keaton's comedies rocked Hollywood's silent era with laughter throughout the 1920s. 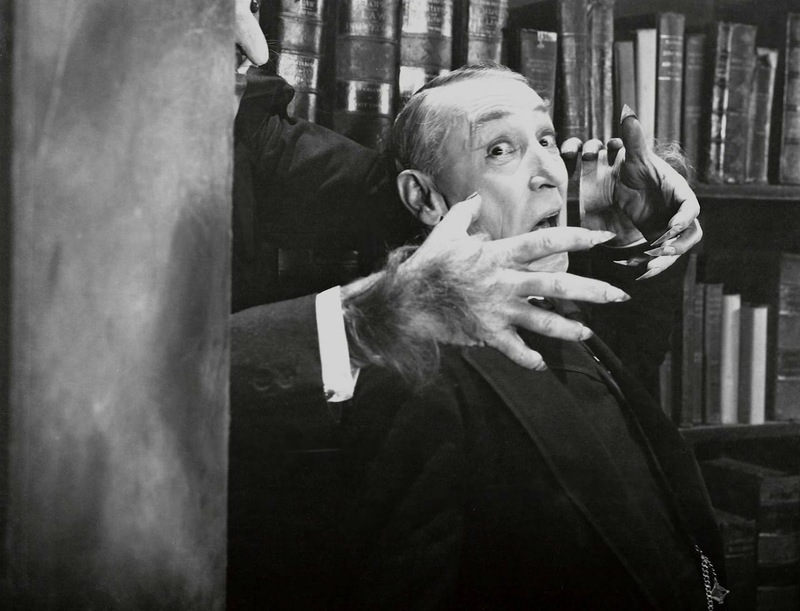 Acclaimed for their originality and clever visual gags, Keaton's films remain popular crowd-pleasers today. 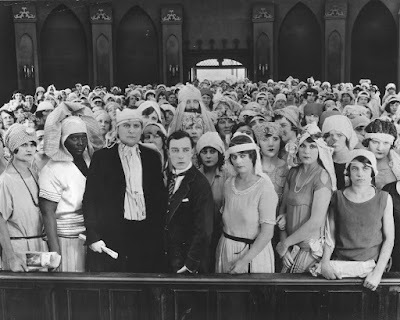 See for yourself with a screening of 'Seven Chances' (1925), one of Keaton's landmark feature films, on Tuesday, Jan. 31 at Phillips Church at Phillips Exeter Academy. The program starts at 7 p.m. and is free and open to the public. Live music for the movie will be provided by silent film accompanist Jeff Rapsis. The screening is part of the Phillips Exeter Academy Music Department's ongoing Concert Series. 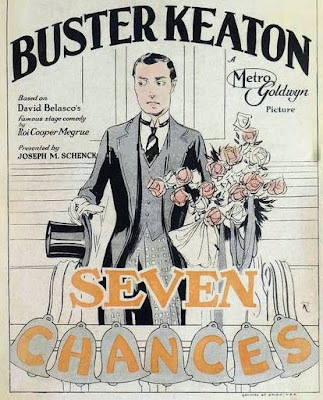 Adapted from a stage play, the story finds Buster learning that he'll inherit $7 million if he's married by 7 p.m. on his 27th birthday—that very day! The program will open with a short Keaton comedy as a warm-up to the main feature. In reviving Keaton's 'Seven Chances,' organizers of the Music Department's concert series aim to show silent film as it was meant to be seen—in restored prints, on a large screen, with live music, and with an audience. "All those elements are important parts of the silent film experience," said Rapsis, who will accompany the film. "Recreate those conditions, and classics of early Hollywood such as 'Seven Chances' leap back to life in ways that audiences still find entertaining." Rapsis performs on a digital synthesizer that reproduces the texture of the full orchestra, creating a traditional "movie score" sound. He improvises the complete score in real time during the screening. "Creating a movie score on the fly is kind of a high-wire act, but it can often make for more excitement than if everything is planned out in advance," Rapsis said. Buster Keaton's 'Seven Chances' (1925) will be screened on Tuesday, Jan. 31 at 7 p.m. at Phillips Church, at the corner of Tan Lane and Front Street, Phillips Exeter Academy. Admission is free and the screening is open the public. For more information about the Music Department's concert series, call (603) 777-3586. For more info on the music, visit www.jeffrapsis.com. An original poster for 'Way Down East' (1920). 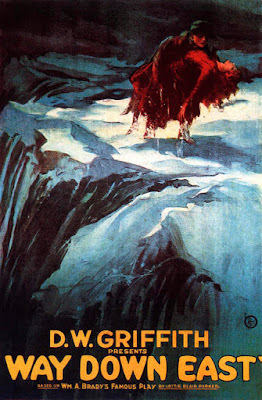 Up next: 'Way Down East' (1920), the classic D.W. Griffith melodrama that finds Lillian Gish as an unwed mother cast out of her rural community, only to wind up on an ice floe rushing toward a giant waterfall and certain doom! Phew! Just writing that one sentence leaves me breathless! Showtime is Sunday, Jan. 29 at 4:30 p.m. at the Wilton (N.H.) Town Hall Theatre. More about this great flick in the press release below. Now, a few notes from the present. Wednesday night saw an enthusiastic crowd on hand for 'The Winning of Barbara Worth' (1926) at the Rogers Center for the Arts at Merrimack College in North Andover, Mass. We don't get many students at the Rogers screenings, but attendance has been steadily building among film buffs in the area. I think we had maybe 75 people. And Wednesday night's audience seemed especially willing to boo the 'Jefferson Worth' character, a contractor who imperils a pioneer settlement by failing to reinforce a dam. And for some reason, the score fell together quite effectively. More than once, I felt I came up with just the right music for important moments. Nice! I'm not sure what things sometimes just work out, but it may be the law of averages. Do something often enough (and I accompany about 100 live screenings a year), some will inevitably come up short, but others will surpass all expectations. Or, to quote Groucho Marx: "They can't all be gems, folks." In general, though, I think doing a lot of films has helped me develop my own musical language and voice that I'm now starting to use in written-down compositions. 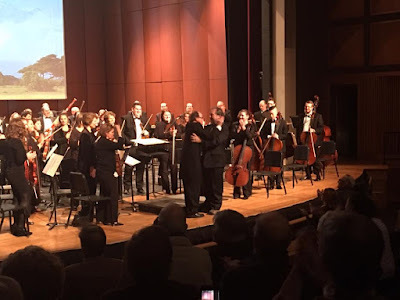 The best example of this was my 'Kilimanjaro Suite,' a 30-minute long score for orchestra that was premiered last Sunday by the N.H. Philharmonic under music director Mark Latham. 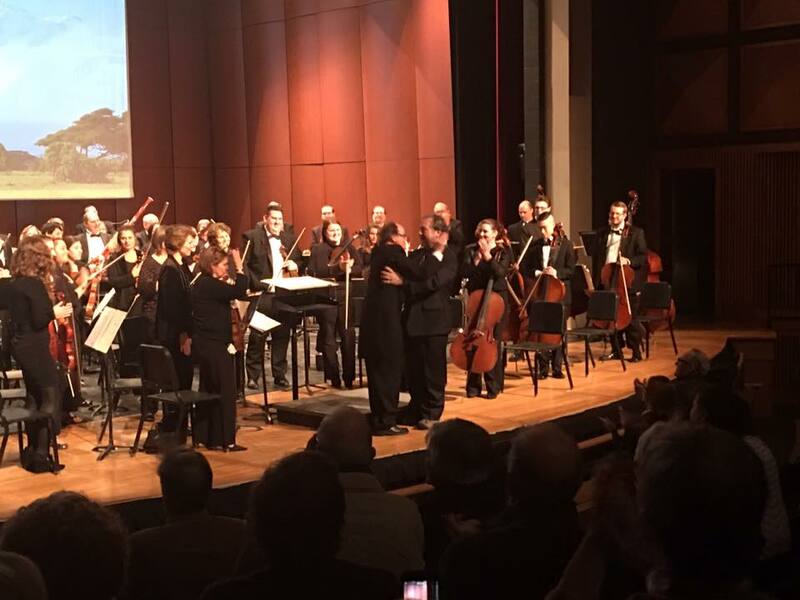 Mark Latham, at left, and me on stage after the performance of my 'Kilimajaro Suite' for orchestra. Although this had nothing to do with silent film, I don't think I could have done it without all the accompaniment I've been doing in recent years. Before this Sunday's screening of 'Way Down East,' I haul myself out to Schagticoke, N.Y. (north of Albany, in the 518 area code) for one of my favorite annual gigs. It's a once-a-year mid-winter community pot luck supper and silent film night at Liberty Ridge Farm hosted by owners Bob and Cynthia Gifford. Taking place in the farm's function room, the event brings together about 100 people who now seem like old friends. This all started when Cynthia's parents were the winning bidders of my services ("Silent Film Screening with Live Music) at a charity auction about eight years ago. They asked if I wouldn't mind driving out to New York. I said "No problem," and the rest is history." We usually show comedies, but this year we're taking a different approach with a "Halloween in January" approach. We'll open the program with Buster Keaton's 'Haunted House' (1921), and then the main attraction is 'The Cat and the Canary' (1927). Boo! Tully Marshall gets a grip in 'Cat and the Canary' (1927). And in-between is one of the best pot luck suppers served north of the Mason-Dixon line, or any other line you can name. Interested? Anyone's welcome to attend, as long as you bring a dish for the pot luck or make a donation to the big glass jar to help defray expenses. Okay, about 'Way Down East.' I did music for this some years ago at the Wilton Town Hall Theatre, and it was one of the most memorable screenings ever. Why? Because I had prepared for the film, and didn't think it would go over too well—other than the undeniably exciting ending with Gish on those ice floes, it was too old and creaky. How could anyone take this seriously? But Griffith, a former stage director, knew in his bones how to get a crowd excited. And so it was quite surprising to me to find the audience reacting strongly to 'Way Down East' right from the beginning. This engagement continued throughout the picture. And when it came time for Gish to wind up on the ice floes, the place just went crazty! So in seeing this film as it was intended—with live music and a live audience—you can still get a sense of why 'Way Down East' was one of the top-grossing films of the silent era. You can also see what a different it makes when the original conditions of early cinema are in place: a lot of people, a big screen, live music. You get a real sense of why people fell for the movies, and fell hard. There's nothing like it! 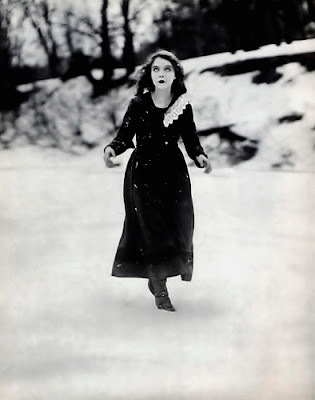 The classic shot of Lillian Gish on the ice floes. 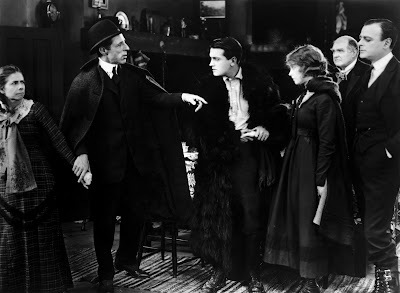 WILTON, N.H. — The iconic image of actress Lillian Gish trapped on an ice floe and headed straight for a waterfall will once again fill the big screen when 'Way Down East' (1920) is revived on Sunday, Jan. 29 at 4:30 p.m. at the Town Hall Theatre, 40 Main St., Wilton, N.H. Admission is free; a donation of $5 per person is suggested to help defray expenses. The movie, a blockbuster melodrama directed by cinematic pioneer D.W. Griffith, is set in old-time rural New England, and was partly filmed on location in New Hampshire and Vermont. It stars Gish in an acclaimed performance as a wronged woman trying to make her way in an unforgiving world. Can she find love and redemption, or will she ride to her doom on the raging river's ice floes? 'Way Down East' will be screened with live music by Jeff Rapsis, a New Hampshire-based silent film accompanist. In 'Way Down East,' Gish stars as a poor New England country girl who travels to Boston to visit her rich relatives in the hopes of getting financial help. While there, she's dazzled by upper class society and romanced by a rich womanizer (Lowell Sherman) who takes advantage of her innocence by tricking her into bed with a fake marriage ceremony. Convinced she's found the husband of her dreams, Gish returns home to the country, only to be abandoned. She informs her faux husband she's pregnant; he orders her to get an abortion. Instead, Gish goes into exile to have the baby, finds herself persecuted for giving birth out of wedlock, and flees even further into the country to seek refuge. The film was noteworthy in its time for addressing such topics as abortion and women's rights. Modern critics hail 'Way Down East' for Gish's performance, which continues to mesmerize audiences nearly a century after the film's release. "Gish provides an abject lesson in screen acting and brings home the importance and effectiveness of seeing a film in a theater with a crowd," wrote Paul Brenner on www.filmcritic.com in 2007. "If you are not moved at the scene of Gish baptizing her dead baby, then you should check the obituaries of your local paper to see if you are listed." The film also stars silent era heartthrob Richard Barthelmess. In the film's climax, Barthelmess must dash to rescue Gish from being carried away on the ice floes. Much of the acclaimed ice floe sequence was filmed in March 1920 on location on the Connecticut River in New Hampshire and the White River in Vermont, as the winter pack ice was breaking up. No process shots or post-production special effects were available to filmmakers at the time, so Griffith and his crew had no choice but to stage and shoot it all on a real river, with the players out on the ice. To get the floes to break up and float down the river, Griffith's crew dynamited pack ice upstream. 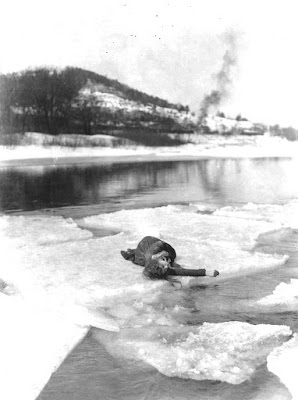 Gish later said that she suffered frostbite by following director Griffith's command to always keep one hand in the water during the shooting. Despite such hardships, 'Way Down East' cemented Gish's reputation as one of the silent era's major stars. Gish would continue to work in films and, later, television, until the 1980s. She died in 1993 at age 99. D.W. Griffith directs a scene from 'Way Down East' (1920). "Films such as 'Way Down East' were created to be shown on the big screen to large audiences as a communal experience," Rapsis said. "With an audience and live music, silent films come to life in the way their makers intended. Not only are they entertaining, but they give today's audiences a chance to understand what caused people to first fall in love with the movies." 'Way Down East' was based on a popular stage drama, for which director Griffith paid the then-astounding sum of $175,000 to turn into a movie. The picture proved to a be a huge moneymaker, taking in $4.5 million, making it the fourth-highest grossing movie of the silent film era. 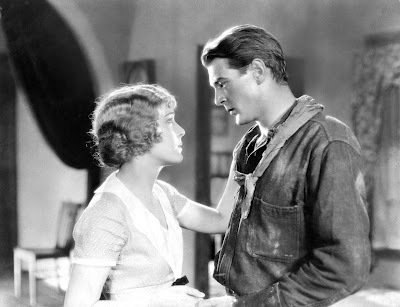 'Way Down East' would be the last of Griffith's great blockbusters; tastes changed as the 1920s rolled on and Griffith's Victorian style fell out of favor. Receipts from 'Way Down East' kept Griffith's studio afloat during a subsequent series of box office flops. "This picture was a monster hit when it was released," Rapsis said, "and it still holds up well today. As a melodrama, it's a great film for an audience to cheer on the good folks and boo and hiss the bad guys. But there's an additional level of interest now because the film captured a way of life that's long since disappeared." 'Way Down East' will be shown on Sunday, Jan. 29 at 4:30 p.m. at the Town Hall Theatre, 40 Main St., Wilton, N.H. Admission is free; a donation of $5 per person is suggested to help defray expenses. For more info, visit www.wiltontownhalltheatre.com or call (603) 654-3456. For more info on the music, visit www.jeffrapsis.com. Next up on the accompaniment calendar: a movie that I can't believe I didn't know about for such a long time. It's 'The Winning of Barbara Worth' (1926) and despite the clunky title, it's a real winner, with something for everyone. And you can see for yourself when the film is screened on Wednesday, Jan. 25 at 7 p.m. at the Rogers Center for the Arts at Merrimack College in North Andover, Mass. Admission is free and the program is open to the public. A lot more info about the film and the screening is in the press release I've pasted in below. Why am I so up on 'The Winning of Barbara Worth'? • It was filmed in Nevada's remote Black Rock Desert, which gave director Henry King incredible vistas and unsurpassed location shooting. • Although it's a high-stakes drama, it's filled with warm comic touches that are so typical of director King's style, and which greatly enrich the film. • It's a Western, but not about injuns and bandits. Instead, it's a story about agriculture and water and the settling of the American West. I know that last point doesn't sound too compelling, but it makes all difference. The story of 'Winning' takes place amid the first attempts to irrigate California's arid Imperial Valley—the vast area west of Los Angeles and San Diego. Pioneering settlers recognized the valley could be an agricultural paradise if only water could be brought to it. So in the late 19th century, grand plans were made to reroute the nearby Colorado River so it would flow into and through the valley. However, in 1905, the Colorado famously overflowed the dikes and canals under construction and an out-of-control deluge caused extensive flooding and the inadvertent creation of the land-locked Salton Sea, which we still have with us today. The river was eventually controlled, and today the Imperial Valley is indeed is one of the most productive growing regions in the world. In 'The Winning of Barbara Worth,' this series of events provides the setting for human drama that takes place among the heroic efforts to transform the valley. Unlike so many films from long ago, this one rings true even today, I think. The cast, the setting, the story—all combine to show the narrative power of silent film at the peak of the form. And for some reason, it's not as well known as it should be, even among film fans. I only discovered it a few years ago, when working with Kevin Brownlow on a presentation about the American West in silent cinema. It could be the title, which is a mouthful and doesn't do much to convey the scale and scope of this production. Well, whatever the reason, here's your chance to catch up with one of the silent era's under-appreciated gems. See you at the screening! For more info, check out the press release below. Vilma Banky and Gary Cooper in 'The Winning of Barbara Worth' (1926). NORTH ANDOVER, Mass.—A film that helped create Hollywood's love affair with the American West will continue this season's silent film programming, part of the Tambakos Film Series at the Rogers Center for the Arts in North Andover, Mass. 'The Winning of Barbara Worth' (1926), a silent drama starring Gary Cooper, Ronald Colman, and Vilma Banky, will be shown on Wednesday, Jan. 25 at 7 p.m. Admission is free and the screening is open to the public. Live music will be provided by accompanist Jeff Rapsis, a New England-based performer who specializes in creating music for silent film presentations. 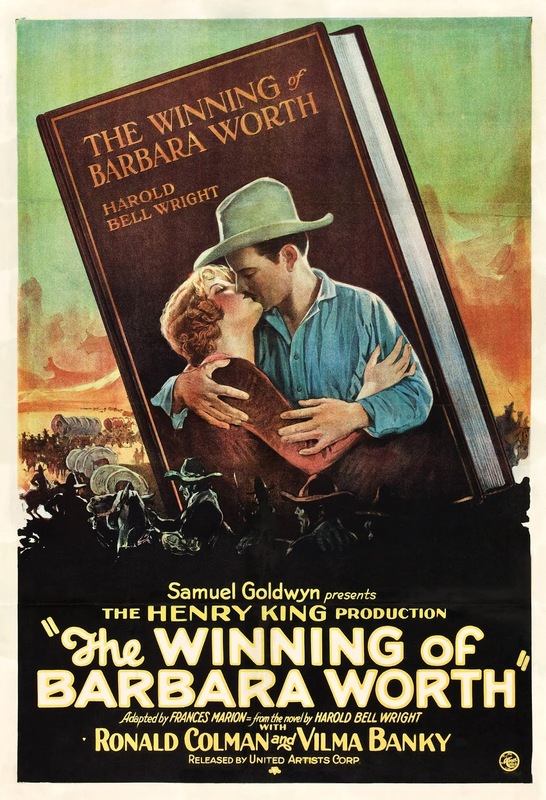 Directed by Henry King, 'The Winning of Barbara Worth' chronicles the epic story of pioneer settlers who dreamed of irrigating California's parched Imperial Valley in the early 20th century. Filmed on location in Nevada's Black Rock desert, the movie is noted for its extensive use of vast open spaces and wild scenery. The story centers on a rivalry for the affections of Barbara Worth (Vilma Banky), adopted daughter of a powerful rancher. A local cowboy (Gary Cooper) finds himself competing with a newly arrived engineer (Ronald Colman), who has come to the rural valley to work on plans to harness the Colorado River for irrigation. Will the local ranch hand prevail over the city slicker engineer? Can citizens of the parched region prevail over nature and transform their lands into an agricultural paradise? Will rumors of shortcuts taken in constructing a massive dam lead to disaster? All these questions combine to create a film that showed Hollywood and movie-goers the power of a drama set in the rural American west. The film is also noted for its camerawork by Greg Toland, who would later go on to do principal photography for 'Citizen Kane' in 1941. For 'The Winning of Barbara Worth,' Rapsis will improvise a score from original musical material that he composes beforehand, using a digital synthesizer to recreate the sound and texture of a full orchestra. "What I try to do," Rapsis said, "is create music that bridges the gap between a film that might be 80 or 90 years old, and the musical expectations of today's audiences." 'The Winning of Barbara Worth' continues another season of silent films presented with live music at the Rogers. The series provides local audiences the opportunity to experience silent film as it was intended to be shown: on the big screen, in good-looking prints, with live music, and with an audience. “These films are still exciting experiences if you can show them as they were designed to be screened,” said Rapsis, accompanist for the screenings. "If you haven't seen a silent film the way it was intended to be shown, then you're missing a unique experience," Rapsis said. "At their best, silent films can be surprisingly sophisticated. They still retain a tremendous ability to cast a spell, engage an audience, tap into elemental emotions, and provoke strong reactions." The 2016-17 Tambakos Film Series, which runs most Wednesday nights during the semester, focuses on Silent Films with live musical accompaniment, Hollywood classics and foreign masterworks. It continues on February 1st with crime thriller ‘The Grandmaster’ followed by A Clockwork Orange, Taxi Driver, and Jules et Jim. The next masterpiece in the Silent film Series is "The Passion of Joan of Arc" (1928). Danish director Carl Dreyer's intense recreation of the trial of Joan of Arc. 'The Passion of Joan of Arc' will screen on Wednesday, March 22, 2017. All films are screened at the Rogers Center for the Arts, Merrimack College, 315 North Turnpike St., North Andover, Mass. For more information, call the Rogers box office at (978) 837-5355 or visit www.merrimack.edu/rogers. The N.H. Philharmonic rehearsing under Mark Latham on Sunday, Jan. 22. I'm thrilled to say that this weekend, I'm not performing anywhere! Rather, I'll be in the audience while some other very talented musicians play a concert that includes music that I composed. It's the 'Kilimanjaro Suite' for orchestra, and the concert is Sunday, Jan. 22 at 2 p.m. at the Stockbridge Theatre, Pinkerton Academy, Derry, N.H. There's a whole page about this concert and the music already posted, and I encourage you to check it out! I also encourage you to attend: tickets are available at the box office or online at www.nhphil.org. And I hope you'll come not because there's music by me on the program, but mostly because the Philharmonic should be encouraged to take risks like this. What risks? Well, agreeing to play a new work by an unknown local composer. In the rarefied world of so-called "classical" music, this is an extremely rare thing. And yes, risky. Who is this guy who thinks he can write stuff for a bassoonist to play, plus 60 other musicians—including a second bassoon player! 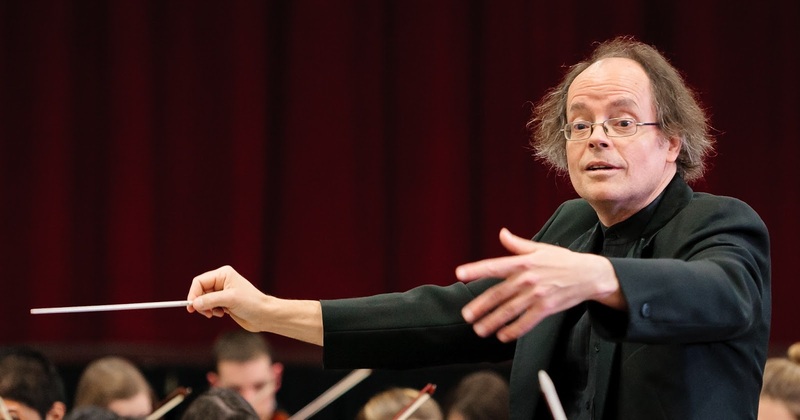 But music director Mark Latham and the Philharmonic musicians are living up to their mission to serve as a "living laboratory" of live concert music played by local people—and sometimes even written by local people! And truth be told, I've been studying and preparing for this opportunity for most of my life, really. It's just that it's not every day that a symphony orchestra comes along and asks you to dance, so to speak. In my case, when I came back from Kilimanjaro, Mark encouraged me to create music about my journey even when I wasn't sure what it would be about. The issue was that prior to climbing Mount Kilimanjaro, I had heard and read many stories about how such an adventure is a life-changing experience. All the time we were trekking around the mountain, I was certainly thrilled to be there. But I was still always waiting for that big lump-in-the-throat moment. On our trek: is that a lump in my throat? Or did I swallow a rock? The short version is that the moment never came. And for awhile I thought there was something wrong with me. Was I too tired? Too old? Was I past my emotional expiration date? Was I no longer able to feel things? But I later realized that perhaps Kilimanjaro was telling me something after all. By virtue of its silence, maybe it was saying that my life didn't really need to be changed all that much. If my life needed changing, the mountain wasn't about to do it for me. I had to make it happen myself. That felt right. And as soon as I realized that, the music started to take shape. Unfortunately for Mark and the Philharmonic, it morphed from a modest musical travelogue into a full four-movement symphony all-but-in-name. To Mark's credit, he let the composing process play out, insisting that I bring all the movements to completion so the orchestra could at least run through them. Thus we have this Sunday's premiere of the full score—the most ambitious artistic project I've undertaken since the "April Fool's" edition of the Goffstown News in 1996. And the process of composing this work and preparing it for performance has been immensely satisfying in many ways. For one thing, it was really rewarding to conceive of something I thought was worth saying, and then to find a way to express it. Also, it was satisfying to draw upon all the arcane knowledge I've accumulated over the years about the orchestra, the instruments, and how a score is put together. It's an unusual field—an archaic craft, really, not unlike glass-blowing or candle-making, except on a larger scale. So it's nice to get to make a few bottles, so to speak. But most of all, it was gratifying to draw from the personal musical language I've developed for film scoring and use it in a concert work. For almost 10 years, I've been improvising live musical scores to full-length silent movies, averaging about 100 screenings a year. It's given me the time and the space to figure out some things on my own—things that I don't know if I could have discovered through a traditional teacher/student relationship. And with the Kilimanjaro music, I can see how it's now time to make use of that language in other ways. So now I have projects I plan to work on: scores to write, pieces to put down on paper so others can play and hear them. My ultimate goal: an opera about the notorious Pam Smart case. This is something I've wanted to do for some time—and for many years didn't think would ever happen. Compose new music for orchestra? I thought that train had left the station long ago, both for me and for the culture in general. New music for a symphony orchestra that could connect with audience in the 21st century? Talk about a hopeless cause! But though the kindness and support of so many people, I've learned that even if you've missed one train, others are likely to come after it. And so here's an irony. After composing a whole symphony about how Mount Kilimanjaro didn't change my life, it may have done so after all. Well, we'll find out Sunday! P.S. It won't be announced at the concert, but go backstage afterwards to join us for a slice of Kilimanjaro-shaped cake! As I now know, this is Mr. Hardy, not Mr. Laurel. When asked, I sometimes say I've enjoyed older movies my whole entire life. But that's not quite accurate. To be precise, I would have to say my interest in vintage cinema dates from one exact day: Jan. 18, 1977. Why then? 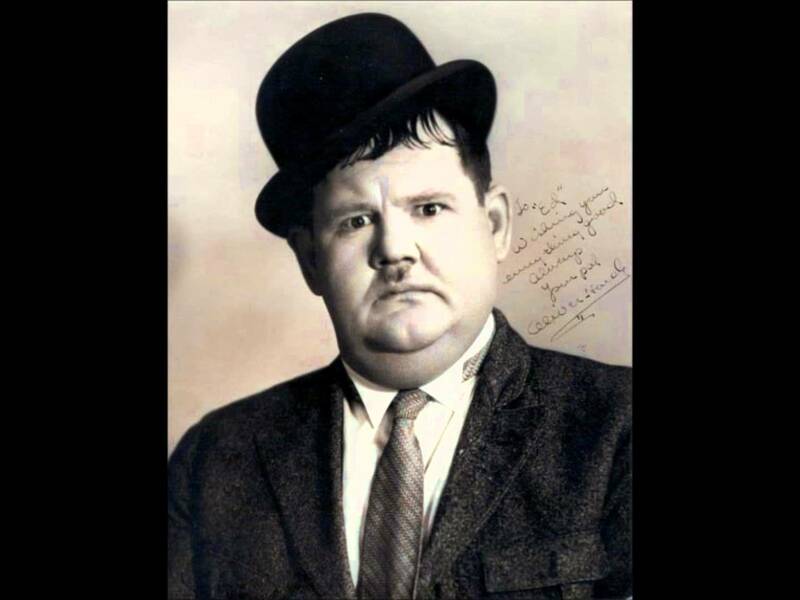 Because that day happens to be the birthday of "Ollie," otherwise known as actor Oliver Norvell Hardy, one half of the comedy duo Laurel & Hardy. And it was the announcement of Hardy's birthdate on a local radio station's almanac that morning that got my 7th-grade mind thinking. I recall sitting at the kitchen counter in our home in Nashua, N.H. poking over a bowl of cereal before heading out for the loooong walk to yet another day at Spring Street Junior High School. Spring Street Junior High in downtown Nashua, N.H., long since torn down. The walk was long (about 1.2 miles) because we lived just inside the limits of the school's bus routes. But that's another story. Like many households in my hometown at the time, the kitchen radio was glued to WSMN-AM 1590, a local station that broadcast local Weather, Sports, Music and News (get it?) all day long. 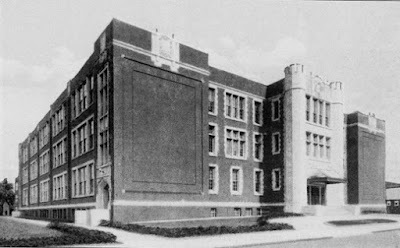 Unlike Spring Street Junior High, the radio station is still around: https://en.wikipedia.org/wiki/WSMN. Back then, our morning routine was driven largely by the station's programming schedule. Example: If you were still home when the obituary report came on, you were late for school! Anyway! 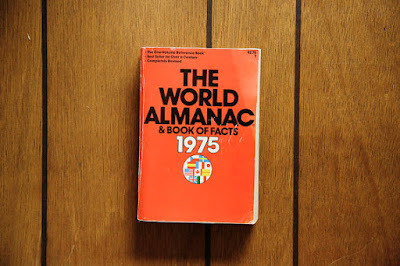 Whoever was on air would occasionally read almanac items to fill time until the news, or the next commercial for Eddie's Bedding or Hammar Hardware. And on that morning of Tuesday, Jan. 18, I learned that it was the birthday of noted film comedian Oliver Hardy, "born this date in 1892." One reason that clicked was that the front entrance to Amherst Street Elementary School, where I'd just spent six years, had a big stone block embedded in it with that very date: 1892! But there was more. I'd just discovered Laurel and Hardy through their films on Channel 38, a UHF station out of Boston that at the time was heavy on old-time programs: re-runs of sit-coms, the Three Stooges, and occasionally older stuff like the Laurel & Hardy shorts and features. I enjoyed it all, just like any other TV-mesmerized kid of my generation. But something about hearing that today was the birthday of one of the people I'd been watching—and the realization that he was a real person and not just some cartoon on TV—pushed my 13-year-old brain into curiosity mode. Oliver Hardy. I remember actually thinking the fat one was "Laurel" because that sounded to me like what a fat guy would be named, and so the skinny guy must be Hardy. Was that right? And if today was his birthday, and he was born in 1892, I figured he was now...87 years old! And I was 13, so together that made 100. But did I have the right guy? Was he the fat one or the skinny one? This led me to pick up the thick "1975 WORLD ALMANAC and BOOK OF FACTS" that was laying around (our version of Google in the pre-Internet era) and found a page on "Celebrity Births and Deaths." Wow! 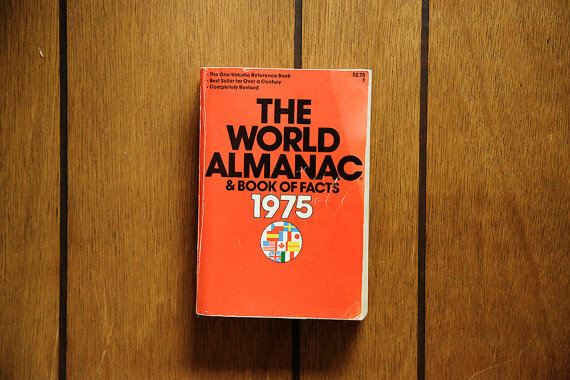 I found a picture of the 1975 World Almanac AND paneling that's exactly like what was in our semi-finished basement and rumpus room! And sure enough, there he was: Oliver Norvell Hardy, film comedian, 1892-1957. What? Mr. Hardy wasn't 87 years old. He was dead! And I still wasn't sure if he was the fat one or the skinny one, but something about it started me on a journey that took me to the shelves of film books at the Nashua Public Library, which had a handful of books on comedy and yes, was able to get a much better idea of the lives of both Mr. Laurel and Mr. Hardy, including who was who. Not long after that, a music teacher at Spring Street named Mr. Salvo began bringing in 16mm prints of the Chaplin Mutuals (his immortal two-reel comedies from 1916 and 1917) to run in study hall to entertain bored students. Most students remained bored, but thanks to my research on Mr. Hardy, I was now ready to find out a lot more about Mr. Chaplin. Who was he? What was he like? What were his dates? So back to the library I went. And journey of discovery, although put aside at times, has never really ended. And so today, on Jan. 18, 2017—a full 40 years later to the day!—I say thank you, Ollie. And happy birthday once again! Original promotional art for Gloria Swanson in 'Zaza' (1923). Excited about something unusual for me: not one but two separate silent film score recording projects coming up. Tomorrow (Saturday, Jan. 14), I'll record music for a re-release of 'Homecoming' (1928), a German drama about World War II that will soon be re-issued on DVD by ReelClassicdvd.com. And then next Saturday (Jan. 21), I'll lay down tracks for 'Zaza' (1923), the Gloria Swanson film being re-issued this spring in Blu-Ray by Kino-Lorber. In both cases, I'll be recording the music in the recital hall of the Manchester Community Music School in Manchester, N.H. Many thanks to Judy Teehan, Valerie Gentilehomme, and the entire staff of the music school for making the space (and the nice grand piano!) available. Also, I need to thank N.H. filmmaker Bill Millios in advance for helping me engineer the recording. I'm in the process of putting together my own set-up to record and edit music files, but I'm not quite there yet, and Bill is willing to help bridge the gap. All this is unusual for me because until now, I've generally resisted having my film score work recorded. Why? I don't know if this is something people can understand, but let me try to explain anyway. I've found when I create live music in the moment, largely through improvising while a film is playing, it takes about 10 minutes or so to get into what I call the "silent film accompaniment zone." What I mean by that is that it takes about 10 minutes for me to settle into the mental place where the music seems to flow naturally and freely from wherever it comes from. This is the time needed for all the self-editing and self-consciousness and critical judgmental functions to fade away, at least for me. After that, the music seems to come easily. In other words, I get to a place where my critical faculties are minimized and I stop second-guessing myself. And that's when the magic starts. However, I've found that when I'm aware that I'm being recorded—when I'm aware that every note will be preserved for posterity—it's been difficult for my critical self to fade away. Really. The presence of a live microphone really makes my self-conscious. And it never seems to subside, and so it's much tougher to reach that "silent film accompaniment zone" where everything comes so easily. If one thing goes wrong, I overreact. I overthink. I question myself all the more. And so on. So rather than record anything, I've gotten along for quite awhile now thinking of myself as a "live performance" artist only: one whose work exists only in the moment, in one place, and in one way before a certain audience. To get it, you had to be there. So what's with this sudden spurt of recording projects? Well, a couple of things. For one, I think I've been doing silent film accompaniment long enough to have a good sense of my own style and how to use it effectively. At the risk of sounding too full of myself, I have something to contribute, however minor. But also, I'm at a point where I sense it would be good to stretch myself—to push into areas that I've shied away from, if only for the satisfaction of making an attempt. Writing down music (as in my Kilimanjaro Suite) is one way. And recording it is another. So it seemed like fate or chance or whatever was in agreement that I should try to get more comfortable with recording. After agreeing to score 'Homecoming,' I was contacted by Bret Wood at Kino-Lorber at doing music for 'Zaza' (1923), which I had accompanied earlier in 2016 at the Packard Theatre at the Library of Congress campus in Culpeper, Va.
'Zaza' was pretty big news because it's a Gloria Swanson picture that's never been reissued in modern times. So I need to thank Rob Stone at the Packard Center for bringing me in to accompany the film last year, and then for recommending me to Bret. But Bret upped the ante by asking that I create a score using as much as possible music from an original cue sheet for the film that he'd found at the George Eastman House. As an accompanist who specializes in creating my own music to score silent pictures, I've found that having to pieces from other people, no matter how good, is another barrier to me being able to reach that "silent film accompaniment" zone. Even if I memorize music so that I could play it while reciting the alphabet backwards, the scoring of a film just doesn't happen naturally for me when it's someone else's stuff. But Kino-Lorber had a vision for this, and had already paid for the cue sheet. So I gave it a look and found that every single melody in it (just the opening phrase, and no supporting chords) was something I'd never heard of in my life! Ouch! Undaunted, I contacted the one person in the silent film world I thought would know where I could find at least a few of these pieces: Rodney Sauer, the founder and pianist of the famed Mont Alto Motion Picture Orchestra, based in Boulder, Colo.
And I'll be darned if Rodney didn't reply almost instantly with word that he had sheet music for about a dozen of the cues, accompanied by his own cheeky observation that some of them "are actually good music." So Rodney sent what he had to me—a mix of obscure tunes, sentimental ballads, and "photoplay music" written specifically for silent film musicians to use. And for the past week, I've been reading through it and trying to "make it my own" as much as possible in advance of the recording session a week from tomorrow. Well, wish me luck on these two recording projects. I would like to do more, but that will only happen if I can get through these without completely screwing them up. And the trick to doing that, I think, is to somehow forget that I'm being recorded at all, and hope that the music flows naturally. Can I do it? We'll find out soon enough! Original poster art for 'Peter Pan' (1924). 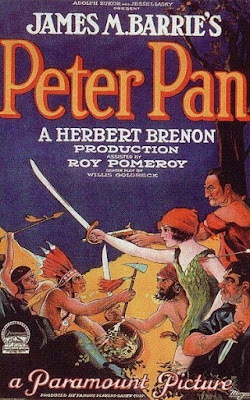 Up next on the accompaniment calendar: the original silent film version of 'Peter Pan' (1924), which we're running on Thursday, Jan. 12 at 6:30 p.m. at the Flying Monkey Moviehouse and Performance Center in Plymouth, N.H.
More details about that screening are in the press release pasted at the end of this post. A capacity crowd cheered 'Metropolis' (1927) last night, which I accompanied at the Aeronaut Brewing Co. in Somerville, Mass. And when I say "capacity," that's what I mean. The brewery's main room, which doubles as a performance space, was absolutely packed from one side to the other. That "standing room only" syndrome often creates the kind of excitement that helps a silent film come to life, and that's what happened last night. Also, with outside temperatures hovering around 0 degrees Fahrenheit, it helped keep everyone warm and cozy! Look for details soon about a special "pre-Valentine's Day" silent film screening at Aeronaut on Sunday, Feb. 12. I haven't looked back at the records, but 'Metropolis' is probably the one film I've accompanied live more than any other. It's a perennial favorite and seems to always produce a strong turn-out—heck, we did it at Aeronaut just last April, and this repeat show still sold out. People just never seem to tire of it. Because of how frequently I've done music for it, I have a set of 'Metropolis' melodies and chord sequences that I've come to use in scoring the film. The music always comes out differently, because during the screening I improvise freely. But I draw from the same set of maybe a half-dozen themes that I've developed over the years. There's a set of chords and a melody for the machines and the great city. There's another melody for Freder Fredersen, and one for his father, both of which get used extensively beyond just signifying the each character. Freder's tune comes to signify the noble aspirations of the brotherhood the working man, while his father's tune gets used when needed to illustrate the imposition of the will of the upper class in oppressing the working people. And one melody is a favorite: a kind of futuristic brassy Broadway dance tune that gets used when the "machine Maria" first seduces the upper class, and then comes to signify her insidious influence in leading the workers to rise up. There are others, but one that I've never had a satisfying tune for is Rotwang, the mad scientist. Every time I do 'Metropolis,' I try to come up with something for Rotwang that's distinct and helps his pronouncements and actions stand out. But I never seem to get it just right. Until last night: at the Aeronaut, I surprised myself by playing a nervous melody that squirrels around a bit for a few notes, and then jumps up to two higher notes as if surprised, and instantly I knew I had it! In 'Metropolis': Rotwang finally gets his own tune. It's funny, too—the music I use for 'Metropolis' rarely gets recycled for other films that I accompany. It just doesn't fit any other movie but 'Metropolis,' I think. So now that I have a full set of material for 'Metropolis,' I'm thinking of writing it out in some way so that it's not just in my head. Because the movie is structured in three parts, and each is labeled with a musical term, it seems natural to get the music into a three-movement form that mirrors that outline. With the upcoming premier of my 'Kilimanjaro Suite' for orchestra, I've been eager to put more music to paper, and this sounds like a natural to add to the list. About the 'Kilimanjaro' piece: I don't want to overdo it, but here's an update. One unfortunate by-product of last night's 'Metropolis' screening was that I was unable to attend a New Hampshire Philharmonic rehearsal in which they played through parts of the score. In the meantime, we'll have press releases going out this week to all local media about the concert, and I'll post them here (on my Kilimanjaro page, at right) when the time comes. 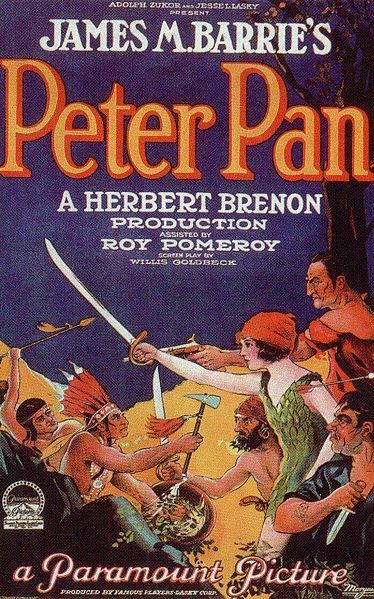 First up, however, is 'Peter Pan' (1924), which probably runs a close second to 'Metropolis' in terms of how many times I've accompanied it live. Betty Bronson in 'Peter Pan' (1924), the original silent film adaptation of J.M. Barrie's famous fantasy. PLYMOUTH, N.H.—It was the film that introduced movie-goers to visions of flying children, magical fairies, human-like animals and menacing pirates. It was the original silent film adaptation of 'Peter Pan,' a picture personally supervised by author J.M. Barrie. The film was a major hit when released in 1924, with audiences eager to get their first big-screen look at the wonders of Neverland. Movie fans can see for themselves when the first 'Peter Pan' (1924) is screened on Thursday, Jan. 12 at 6:30 p.m. at the Flying Monkey Moviehouse and Performance Center, 39 South Main St., Plymouth. The program will feature live music for the movie by silent film accompanist Jeff Rapsis. The film is appropriate for all ages, making for a unique evening of family entertainment. Admission is $10 per person. Thought lost for many years, and overshadowed by more recent adaptations, the original silent 'Peter Pan' maintains its freshness and charm 90 years after its original release. "Improvising a movie score is a bit of a high wire act, but it can result in music that fits a film's mood and action better than anything that can be written down in advance," Rapsis said. "It also lends a sense of excitement and adventure to the screening, as no two performances are exactly alike." 'Peter Pan' is the latest in a monthly series of silent films presented with live music at the Flying Monkey. The series provides local audiences the opportunity to experience silent film as it was intended to be shown: on the big screen, in good-looking prints, with live music, and with an audience. Rapsis said it's currently a new golden age for silent film because so many titles have been restored, and are now available to watch at home or via online streaming. However, the Flying Monkey series enables film fans to really understand the power of early cinema, which was intended to be shown on a big screen, with live music, and with an audience. "Put those elements together like we do at the Flying Monkey, and films from the silent era spring right back to life in a way that helps you understand why people first fell in love with the movies," Rapsis said. • Thursday, Feb. 16, 2017, 6:30 p.m.: 'The Clinging Vine' (1926) starring Leatrice Joy. Recover from Valentine's Day with this gender-bending comedy in which a high-powered female executive yearns to become more feminine. Surprisingly androgynous performance by Joy, wife of MGM megastar John Gilbert. • Thursday, March 16, 2017, 6:30 p.m.: 'Sadie Thompson' (1928) starring Gloria Swanson, Lionel Barrymore. Intense drama of a "fallen woman" who comes to an island in the South Seas to start a new life, but encounters a zealous missionary who wants to force her back to her former life in San Francisco. • Thursday, April 13, 2017, 6:30 p.m.: 'King of Kings' (1927) directed by Cecil B. DeMille. Just in time for Easter: Cecil B. DeMille blockbuster includes crucifixion scene complete with earthquake, landslides, and a cast of thousands. • Thursday, May 18, 2017, 6:30 p.m.: 'Speedway' (1929) starring William Haines, Ernest Torrance. Fasten your seat belts! We mark the traditional Memorial Day running of the Indianapolis 500 with a vintage race car drama filmed right on the famed track—at speeds topping 115 mph! ‘Peter Pan’ (1924) will be shown on Thursday, Jan. 12 at 6:30 p.m. at the Flying Monkey Moviehouse and Performance Center, 39 South Main St., Plymouth, N.H. Admission is $10 per person. For more info, call (603) 536-2551 or visit www.flyingmonkeynh.com. For more info on the music, visit www.jeffrapsis.com. What time is it? Time to return the keyboard! Very excited about my first big show of the new year: doing live music for 'Metropolis' (1927) on Sunday, Jan. 8 at 7 p.m. at the Aeronaut Brewing Co. in Somerville Mass. More details in the press release below! First, a personal note: In show biz, they say timing is everything. And that's certainly true in the very tiny corner of it occupied by silent film. So get this: Three days before Christmas, I woke up to find the hearing in my left ear was messed up! For some reason, what I heard through my left ear was distorted, and also sounded far away. Also, there was a cluster of frequencies—tones around middle C on the musical scale—that were physically painful to hear, producing that "nails on a chalkboard" effect. I had no other symptoms, and couldn't imagine what was going on. There was no wax in my ear, and I hadn't been exposed to loud noise. There was no sign of any physical damage, and nothing felt wrong with my ear. Annoyingly, voices in the "weird" range were hard to take. When I heard news on the radio read by a woman in that alto range, I had to switch stations. In my left ear, a dial tone sounded about a whole step higher, and distant, and also would shift pitch slightly upwards if I tried to listen to it. Another weird sound effect is that at home in the evenings, I would hear a rushing sound, like the water was running somewhere in another room. But it was a completely phantom thing—there was no water running anywhere. I wangled a doctor's appointment that day and nothing was found. I was told to take Sudafed as an anti-inflammatory, and Naproxen as well, and if nothing changed over Christmas weekend, to get an appointment with an Ear, Nose, and Throat specialist. Well, nothing changed, except over Christmas I came down with a monumental head cold that quickly took over and spread throughout my throat and respiratory systems. Uck! With my hearing still screwed up, I then found that trying to get a referral to a specialist in the week between Christmas and New Year's is like expecting an invitation to join the American Academy of Arts and Letters. It just ain't gonna happen. So I was getting a little panicky there, as my cold worsened and with my hearing awry and with some other problems that all happened at once. I got through doing music for a screening of 'Tramp Tramp Tramp' (1926) on Christmas Day, but found I had to point one of my speakers away from me because its output was just too painful to take at the volume it had to be at. What does this have to do with timing? Well, I was very fortunate, I felt, for this to happen at the one time of the year when I don't have a lot of silent film screenings. Count your blessings! And it was a good thing, because this went on for two solid weeks. Over this time, my hearing has gotten closer to normal, which is a relief. But the cold got worse, causing me to stay home in bed for two entire days last week. And then I finally got an appointment with a specialist, which took place yesterday. 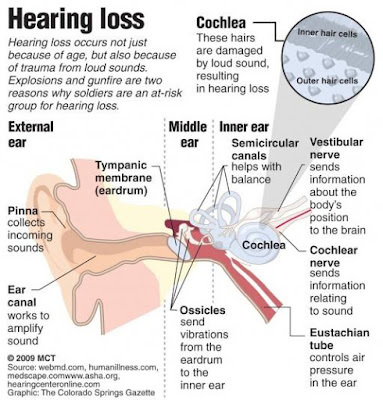 About half of people with SSHL will recover some or all of their hearing spontaneously, usually within one to two weeks from onset. Eighty-five percent of those who receive treatment from an otolaryngologist (a doctor, sometimes called an ENT, who specializes in diseases of the ears, nose, throat, and neck) will recover some of their hearing. Experts estimate that SSHL strikes one person per 5,000 every year, typically adults in their 40s and 50s. The actual number of new cases of SSHL each year could be much higher because the condition often goes undiagnosed. Many people recover quickly and never seek medical help. If my hearing doesn't recover, the next step would be to take a course of steroids (yikes!) and wish for the best. Hope it doesn't come to that, and I'm encouraged that the left ear seems to be coming back. Even so, next week I'm having my head scanned as a precaution (hooray!) due to the very small chance there's a disruption (i.e. tumor!) that's causing this. Meanwhile, the cold is dissipating. Today (Saturday, Jan. 7) is the first day in two weeks I've felt back to normal, or as close to it as I ever am. Alto voices no longer make my teeth chatter, which is a huge relief. A dial tone sounds almost the same from one to the other. And just in time for a big gulp of a screening: 'Metropolis' (1927) on Sunday, Jan. 8 at 7 p.m. at the Aeronaut Brewing Co. in Somerville, Mass. I'm afraid seating is limited, and it sounds like they're very close to selling out. So before you trek down to Somerville for this, please check their online listings for info about ticket status, or call them directly using the contact info in the press release below. Happy New Year and looking forward to making a lot of music (and hearing it, too!) in 2017! 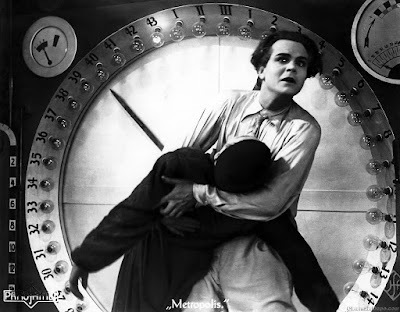 SOMERVILLE, Mass.—A silent film hailed as the grandfather of all science fiction fantasy movies will be screened with live music on Sunday, Jan. 8 at 7 p.m. at the Aeronaut Brewery, 14 Tyler St. (near Union Square), Somerville, Mass. This special screening with live music is open to the public and is part of the Aeronaut's commitment to showcase local music, art, and performance. "This is one of the great all-time classics of cinema, and we're thrilled to present it so fans can experience it with an audience and live music," said Aeronaut spokesperson Christine Holmes. Original music for 'Metropolis' will be performed live by Jeff Rapsis, a New Hampshire-based composer and silent film accompanist who performs at venues in New England and around the nation. 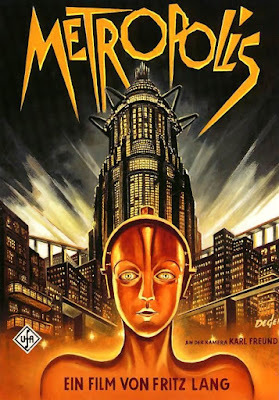 'Metropolis' (1927), regarded as German director Fritz Lang's masterpiece, is set in a futuristic city where a privileged elite pursue lives of leisure while the masses toil on vast machines and live deep underground. In reviving 'Metropolis' and other great films of cinema's early years, the Aeronaut aims to show silent movies as they were meant to be seen—in high quality prints, on a large screen, with live music, and with an audience. A scene from 'Metropolis' (1927). 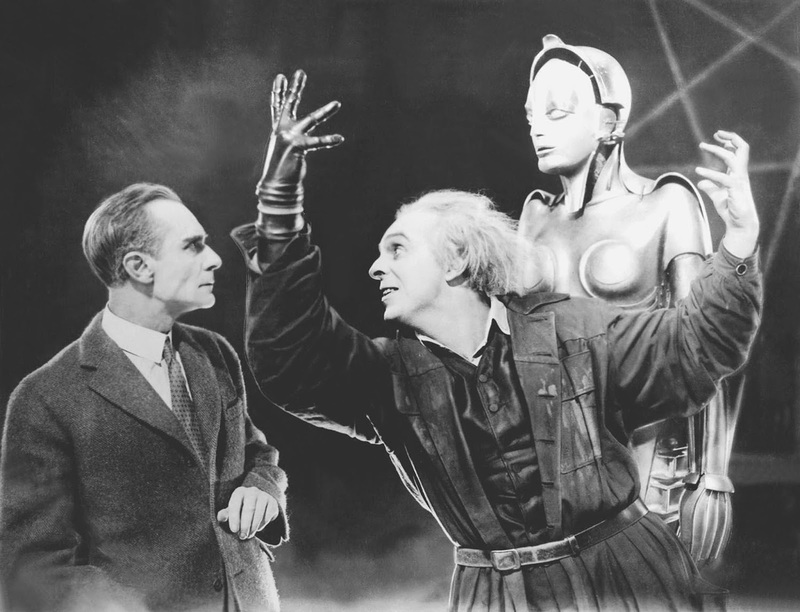 The version of 'Metropolis' to be screened at the Aeronaut is a newly restored edition that includes nearly a half-hour of missing footage cut following the film's premiere in 1927. The lost footage, discovered in 2008 in an archive in Argentina, has since been added to the existing 'Metropolis,' allowing plot threads and characters to be developed more fully. In 1984, the film was reissued with additional footage, color tints, and a pop rock score (but with many of its intertitles removed) by music producer Giorgio Moroder. A more archival restoration was completed in 1987, under the direction of Enno Patalas of the Munich Film Archive, in which missing scenes were represented with title cards and still photographs. More recently, a 2001 restoration combined footage from four archives and ran at a triumphant 124 minutes. It included 25 minutes of "lost" footage, about a fifth of the film, that had not been seen since its Berlin debut. The discovery of such a significant amount of material called for yet another restoration, a 2½-hour version that debuted in 2010 to widespread acclaim. It's this fully restored edition that will be screened at the Aeronaut.
" 'Metropolis' stands as an stunning example of the power of silent film to tell a compelling story without words, and reach across the generations to touch movie-goers from the real future, which means us," said accompanist Jeff Rapsis. To score a silent film, Rapsis uses a digital synthesizer to recreate the texture of the full orchestra. The soundtrack is created live in real time as the movie is screened. Rather than focus exclusively on authentic music of the period, Rapsis creates new music for silent films that draws from movie scoring techniques that today's audiences expect from the cinema. The restored 'Metropolis' will be shown on Sunday, Jan. 8 at 7 p.m. at the Aeronaut Brewery, 14 Tyler St. (near Union Square), Somerville, Mass. Admission is $10 per person. Tickets are available online at www.eventbrite.com; search on "Aeronaut Brewery." For more info about Aeronaut Brewing, visit www.aeronautbrewing.com.